When visiting Alaska, glaciers are one of the top attractions many guests hope to see. These flowing rivers of ice are colossal, visually stunning and have been around for a millennia. However, there’s a lot more to the glacier experience than simply viewing from a nice vantage point. Glaciers are a veritable playground for the adventurous outdoor enthusiast, and here are some of the most popular ways to enjoy one of the coolest natural phenomena on the planet. #1: Take an exciting hike to Worthington Glacier from our Copper River Princess Wilderness Lodge. 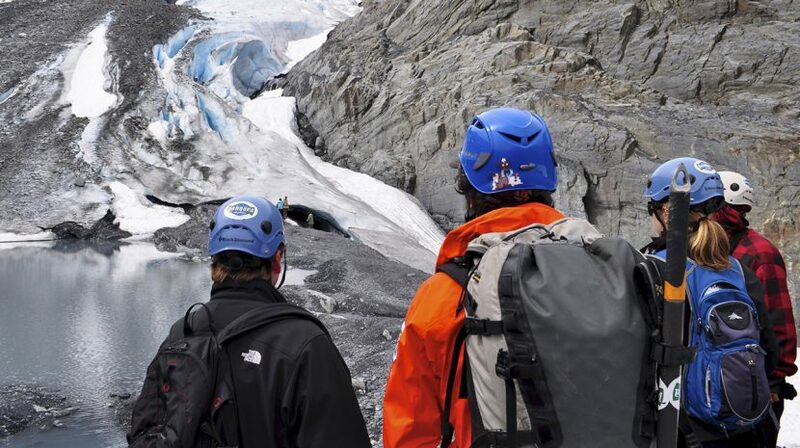 This excursion will have you suited up in the proper glacier gear so you’ll be able to confidently navigate the icy terrain and observe the glacier formations from an up-close point of view that you wouldn’t be able to experience any other way. #2: As soon as winter comes around, the adventurers who’ve spent the season climbing on mountains and rock faces take to the ice to get their climbing fixes. Glaciers are a popular site for climbing up walls of ice with ice picks, crampons and ropes to assist with the ascent. With the proper safety gear and a trained guide, ice climbing is an exhilarating Alaska activity. #3: If you’re staying at our Copper River Princess Wilderness Lodge, hop on the Prince William Sound glacier cruise and see the Columbia Glacier up close from the water. It’s one of the fastest moving glaciers on the continent, and you’ll also have the opportunity to see icebergs and Alaska wildlife in Columbia Bay as the boat cruises around. #4: Another way to experience Alaska’s glaciers is on a dog sled tour over the icy landscape. Via a brief helicopter flight to a glacier, you’ll hop in a sled and depart on a guided dog sled tour, showcasing similar views to a hike across a glacier, but at a quicker pace. It’s the Alaska version of cruising along a scenic byway in the backseat of a snazzy convertible – the perfect combination of thrill and relaxation. #5: Some say you haven’t really seen a glacier until you’ve seen it from a bird’s-eye view, and this is something you can easily do with the Glacier Landing Explorer excursion at the Mt. McKinley Princess Wilderness Lodge. Not only will you be able to see glaciers from above during the flightseeing tour, the airplane will actually land on Ruth Glacier in the middle of the Alaska Range, home of Denali. Up-close views of North America’s tallest peak and the jaw dropping surrounding scenery make for a truly unforgettable experience you’ll recount for years.